These three startups are shaking up the flower business and that's good for flower farmers. Bouq and other companies like Petal By Pedal and Farmgirl Flowers are part of a new crop of startups aiming to change the traditional flower market. The companies share a belief in sustainability and the importance of taking care of the growers who produce their product. 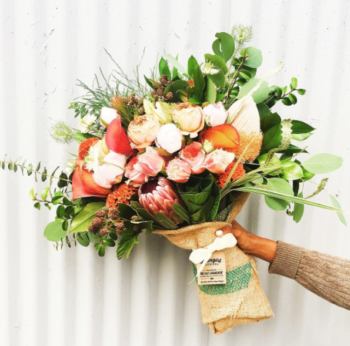 The traditional flower industry model involves farmers growing the flowers that they send to distributors, who sell to wholesalers, who then sell to florists, who then sell to the customer. That’s a fairly long supply chain that often means the farmer and the consumer are getting the short end of the stick – ahem, stem – since farmers don’t always get paid a decent price for their product due to reduced margins and consumers get a product with a short shelf life at an inflated price. Add to that the historically bad working conditions for many flower farm workers across the globe and you’ve got a pretty untenable situation. These three startups have come up with a variety of ways to try to fix these problems. Bouqs was born out of a friendship between founders JP MontÁºfar and John Tabis, who meet at the University of Notre Dame. After college, MontÁºfar returned to his native Ecuador, where his father had been a flower farmer. Tabis and MontÁºfar kept in touch and during several phone conversations realized that there was an opportunity to do something big in the flower business since the industry’s two main stakeholders – the grower and the consumer – were losing out on “some level of value,” MontÁºfar tells Modern Farmer in a Skype interview. He and Tabis launched Bouqs in 2012. The company is headquartered in California, where Tabis, the CEO, lives, while MontÁºfar, the COO, handles his end, growing and managing the export of flowers from other Ecuadorian farms. “The farmers work so hard to produce beautiful flowers, but because of the seasonality and delicacy of the product, along with the many stops along the way from the farmer to the recipient, the farmers were getting undercut and the recipient was receiving a mediocre product that only lasts a few days before dying, which also creates more waste,” says MontÁºfar. The company was featured on the ABC show “Shark Tank” in 2014. Bouqs solved the supply chain problem by cutting out the wholesaler, which means larger margins for the farmers and fresher flowers for the customer. The company designs the arrangements that are then put together by the flower farmers and shipped directly to the consumer two to four days after the flowers are cut instead of up to two weeks with the traditional system. They deliver nationally. The company works with growers on more than 50 farms in South America and the United States and uses third-party verification organizations like Rainforest Alliance, VeriFlora, and Fair Trade, as well as in-person check-ins with the company’s farm partners to ensure they are following sustainable growing practices, taking care of their workers, and protecting biodiversity. The farms pay their workers living wages and in many cases offer on-sit child care, educational programs for their employees, and even paid vacations, says MontÁºfar. Another California-based company, FarmGirl flowers, was launched in 2010 by Christina Stembel. She had been working for Stanford University when she decided to go into the flower business, believing she could solve what she saw as the three big problems of the industry: aesthetics, waste, and imports. Unlike the traditional flower shop model in which as much as 40 percent of the flowers go to waste since the florist has no idea what the consumer is going to buy from week to week, FarmGirl creates a single daily arrangement using the freshest flowers available – and because they’re only offering a single choice, FarmGirl Flowers uses every stem they buy. The company has an average of less than one percent of waste, says Stembel. In regard to sourcing, she says she could never understand why 80 percent of the flowers used in the industry come from overseas. “I would go to these farm-to-table restaurants around San Francisco where they would tell you in Portlandia fashion, the name of the chicken you were eating, but I would see carnations on the table that were most definitely not from the United States,” she tells Modern Farmer in a phone interview. The company is currently using only flowers from American farmers, but due to sourcing issues because of the company’s fast growth (they now deliver nationwide) they may have to expand into buying from smaller family-run farms in Ecuador that they know and trust. But, says Stembel, she will continue to work with American farmers first. “If it’s a fair price based on what American growers need to pay their workers so they can at least get minimum wage, overtime, hopefully medical, then we’ll always buy it from them, even if it’s three to four times more than what we could get it for internationally,” she says. Stembel, who grew up on a corn and soybean farm in Indiana, is also looking into the idea of getting crop farmers to expand into growing flowers for the company. “I’m trying to think outside the box to try to find people here in the U.S. first who can grow to the scale we need,” she says. Kate Gilman launched her company Petal By Pedal in 2o13 with the idea of only sourcing from local flower farms and delivering the bouquets around Manhattan by bicycle. 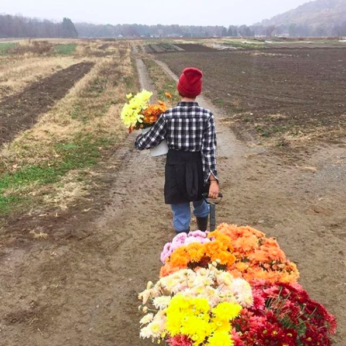 She began with a couple of New York flower farmers and has since expanded to working with more than a dozen farms across Long Island, the Hudson Valley, and even a rooftop and two educational farms in Brooklyn. “We work with regional flower farms because not only does it support local farmers, something we are incredibly passionate about, but it’s also better for the environment as a whole and creates a cleaner, longer lasting product for our customer,” says Gilman in an email. Because they work with farms that are relatively close by, the company knows how the farms grow their flowers and who they “rely on for labor,” Gilman tells Modern Farmer. She says that many of large flower farms outside the U.S., in addition to having large carbon footprints, put their workers at risk due to the harmful pesticides needed for industrial scale production and long-distance travel. “By choosing smaller scale local farms, we can monitor every aspect of operations and can encourage a more balanced use of the environment in that region,” says Gilman. Like FarmGirl Flowers, Petal By Pedal doesn’t let the customer choose specific blooms, but does allow them to choose a size and color scheme. This allows the farmers “to do what they’re best at and grow what grows well in their soil and harvest when appropriate,” according to Gilman. It also allows Petal By Pedal to get their bouquets to customers the same day or a day after the flowers are harvested. They currently only deliver in Manhattan, but are expanding into Brooklyn this winter, says Gilman.